Our wish to you for 2015 is a released imagination. Often we urge readers “Turn Your Passion into Profit” and “Go Try Things“. Here is our suggestion for this New Year. This year when your imagination starts to fly, ride with it. Maybe you are planning a trip to Ecuador, start a new business or like Merri and me, envisioning some business in Cuba? Someone or something might try to reign you in. Ignore them or it and let your imagination soar without limit. Can you imagine Bog Snorkeling… or more? Click on image to enlarge. Image from Green Events website (1). “Let Your Imagination Free.” We live in an era that is dominated by bad news, not because it is all bad, but because bad news sells. Short term thinking in most establishments means that sales and profits reign. We also live in an era where commercial forces try to restrict your imagination. Madison Avenue aims to sell you on living and thinking in a way that profits its clients, not necessarily you. That’s the way it’s always been- to a degree. Social and economic forces try to push you into a box. The shaping is simply more effective in this era because it is so much more pervasive. The media and advertising bombard us from daybreak to sunset. Be spontaneous sometimes and do not restrict yourself. Recently our son, Jake, and his girl friend, Miranda, fed up with the rain in the UK, jumped in the car and headed into Wales where the weather report said there was sun. 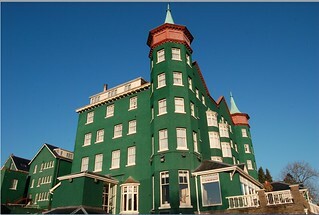 They stayed at this Victorian Gothic Mansion (which they had never even heard of) at Llandrindod Wells in the middle of the Welsh Cambrian Mountains. 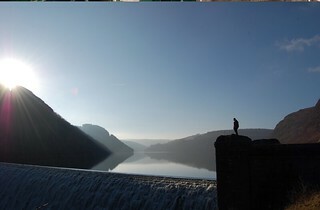 The following morning, they took a tiny B road to the 6 Dams of the Elan Valley – one of the Wonders of Wales, which Jake said “was like falling into a Lord of the Rings set-scape“. How about a business offering bog snorkeling? Of course you would realize that there are the limits to the number of bog snorkelers you can attract. How could you expand a business like that? 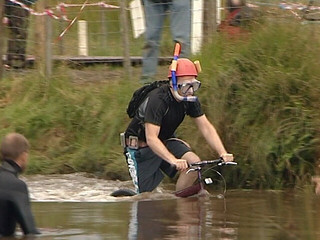 How about adding mountain bike bog snorkeling? Certainly this takes imagination! 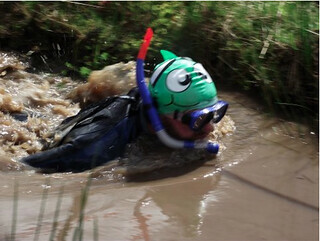 Here is what the Green Events website says: If you think that ordinary bogsnorkelling is just a bit tame for you, then how about trying your luck at riding a mountain bike along the bottom of a 6ft deep water-filled trench cut through the local Waen Rhydd bog! The bike used is specially prepared with a lead filled frame and water filled tyres to ensure grip on the pond bottom. The snorkeller/cyclist wears a lead weight belt to avoid floating off the bike! Divers are on hand for safety purposes. Lead framed bike? Water filled tires? Six foot trench in a remote bog? Divers on hand? This business has imagination. Let 2015 be your year of soaring imagination. Fly high. Don’t reign life’s possibilities in. If Green Events can imagine Mountain Bike Snorkeling, you can imagine more. Release your imagination. Let your passions lead you to ideas for profit. Go try things. Join Merri and me throughout 2015 (but not for bog snorkeling). Join us to learn how to turn your passions into profit.